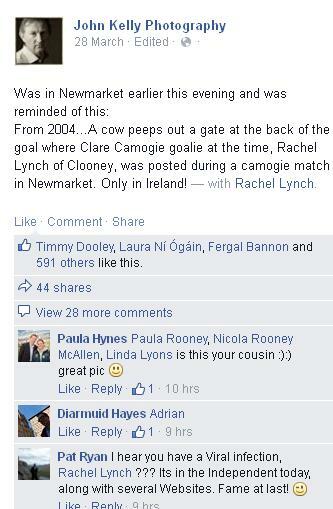 A photo by Clare Champion photographer John Kelly of a cow peering out from behind a gate during a camogie game in County Clare has gone viral with thousands of people sharing the pic on social media. Popular online websites such as Joe.ie and Independent.ie have also posted the photo. While many are claiming the photo was taken at the weekend, it was in fact taken 11 years ago in Newmarket on Fergus according to the photographer. Featured in the photo is Clooney goalkeeper Rachel Lynch who, along with an umpire, appears oblivious to the cow peering through the gate behind her.